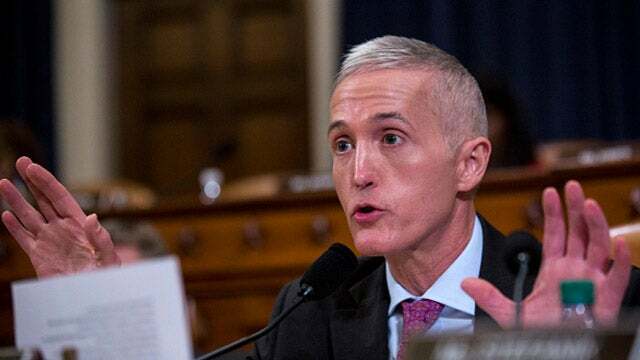 RUSH: Trey Gowdy — which I was gonna mention an hour ago. Gowdy has distanced himself from the Republicans in the House Intelligence Committee who have ended their investigation. Gowdy thinks it is a mistake to have done that. And that’s exactly what Comey said, by the way, in congressional testimony. “Putin wanted her to lose and him to win?” Conaway asked? Comey said they’re inseparable. It’s a two person event. “Logically, when he wanted her to lose,” Comey said to laughter. This is so full of it. This is why you don’t trust any of this. These clowns do not know what Vladimir Putin wanted in terms of preferences. To sit here and tell us that Putin wanted Trump to win and wanted Hillary to lose because of their bogus investigation that doesn’t have any evidence of this? This is all a crock! What the Russians do — the answer to this is, everybody thought Trump was going to lose, including the Russians. There’s nobody in their right mind that thought Trump was gonna win. So undermining Hillary in the Russians’ mind is undermining the winner, not promoting the loser! They’re not the same thing. The Russians’ objectives is to destabilize America, not destabilize Hillary. It’s not to promote Donald Trump. It’s to destabilize America. And they’re getting away with it with the ignorance of these arrogant snobs and the FBI and this investigation mischaracterizing what’s happened here. RUSH: Comey’s up there telling members of Congress (paraphrasing), “Well, it’s one in the same thing. If the Russians are trying to hurt Hillary they’re obviously trying to help Trump.” No! How easily is Comey duped? He believes the dossier which now David Corn and Isikoff say the number one element of the dossier nobody believes it! The golden showers. After all of this time. And how long have these two reporters known this? Well, for as long as they’ve been writing their book. It is not true that if the Russians were trying to harm Hillary they were trying to help Trump. Everybody thought Hillary was gonna win. One week after Trump wins, what do the Russians do? They sponsor a “he’s not our president” rally. And they duped CNN and MSNBC into promoting it. And they got thousands of people to show up to a “he’s not our president” rally, the Russians, who supposedly wanted Trump to win! The Russians want to destabilize the American political system. It doesn’t matter who wins. These clowns want you to believe that if Trump had won, that the Russians would be backing off and that we wouldn’t even be aware of the influence they have over Trump because Trump would have to keep it quiet. What a crock all of this is. Every bit of this is a giant scam, and in the middle of it is a guy with supposedly unimpeachable character and integrity, Robert Mueller of the FBI.